StarGarden provides several components that can be used to design, implement, deploy and work with your defined business processes, mapped as workflows. A business process can include tasks done automatically as well as tasks which require human interaction. the elements used in building your authority rules. 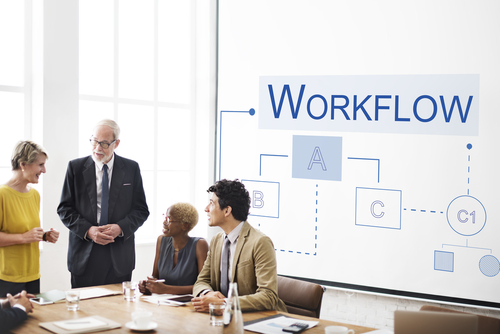 The workflow engine applies authority rules to workflow tasks, maintaining routing integrity regardless of any permanent or temporary organizational changes. StarGarden supports both formal authorities, applied to positions and roles and informal person to person delegations that ensure work tasks can be automatically re-routed to an individual on a case-by-case basis. For example, when a manager takes leave they can informally delegate their authority for the duration of their absence and their workflow tasks will be automatically sent to the recipient of the delegation. Workflows can wrap and maintain data in external and vendor supported databases without any interface or data conversion issues and easily augment these with StarGarden maintained virtual data structures, as required. Provides A User Task List: The StarGarden Portal provides every user with a Task List which presents all the workflow tasks to the user that they are authorised to access, as defined by their identity profile (through their community, role, position, member or delegation authorities). Provides A User Alert & Task Messaging: Users can be alerted to new tasks via the portal or by email notification and any information or on-line resources required to complete a task (including security privileges), are packaged with the task. Users can also interact with other participants via task messaging which provides secure correspondence that is retained for historical reference.